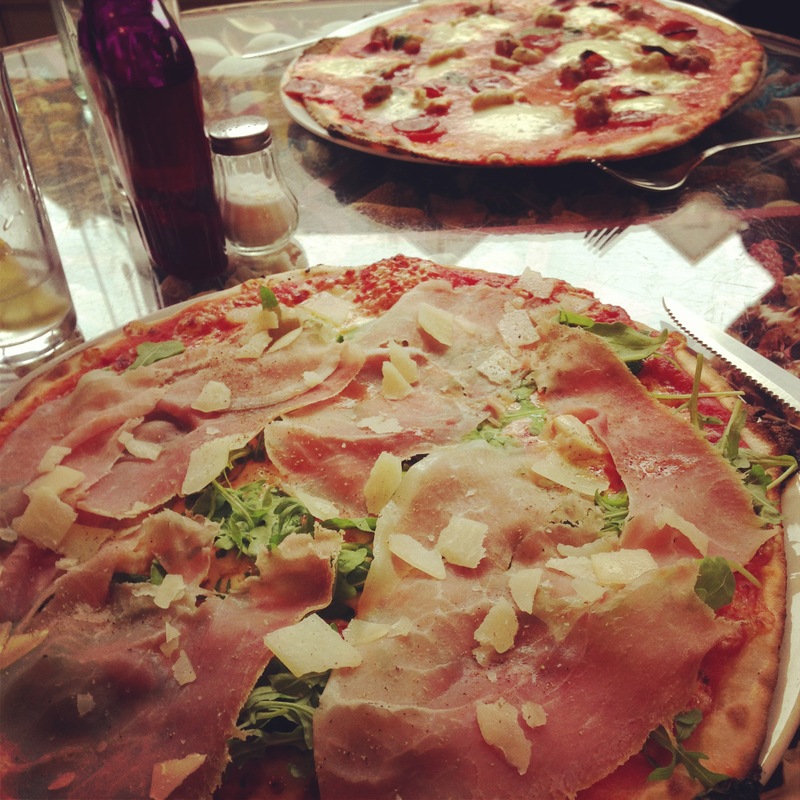 Yesterday Mr S and I decided to make the journey over to Kingston for some authentic Italian food. 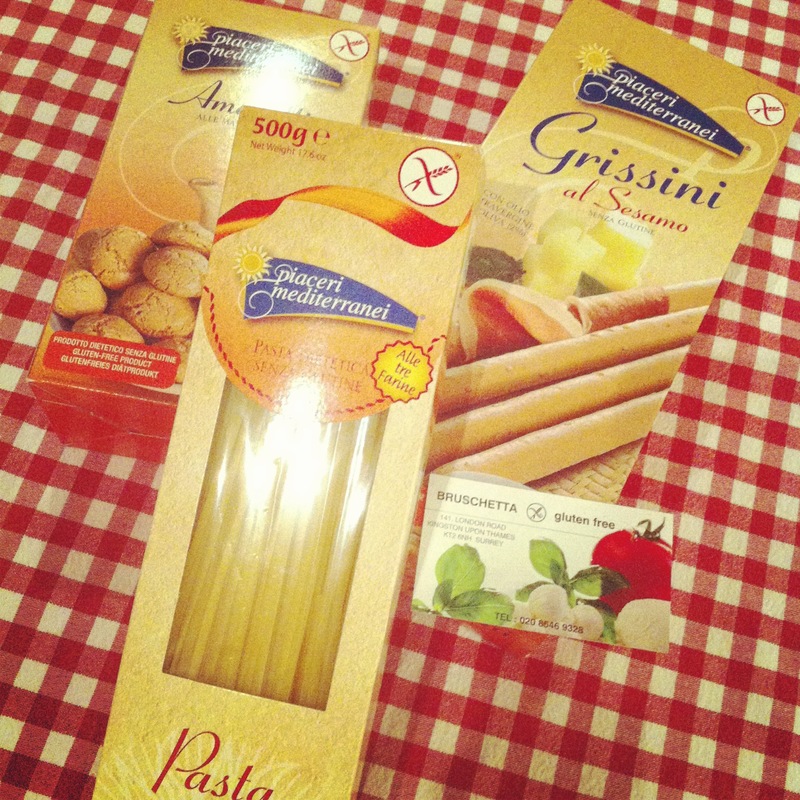 Not just any italian food, but Gluten and yeast free, very exciting! I remember on my first visit to Bruschetta over a year ago I actually had a tear in my eye after eating my first mouthful of Pizza in many years due to my gluten intolerance. Bruschetta turns gluten free eating out, on its head by offering gluten free pizza’s, pasta and puddings to everyone as First choice. You have to ask specially for a regular gluten filled pizza, Brilliant! I never worry about cross contamination when I eat here. Julia herself is gluten intolerant and her sister is a diagnosed Coeliac. On Sunday we were the first people to arrive to the London road restaurant, but Bruschetta soon filled up and had a lovely buzzy atmosphere. Like all good traditional italian restaurants it has a real family feel and I immediately felt transported back to holidays in Italy, In pre gluten free days. The Pizza’s arrived quickly and were enormous and looked fabulous! It is very exciting to be able to eat pizza out in a restaurant, being gluten and yeast free means I cannot eat out at the pizza chains. Making these occasionally treat meals very special. 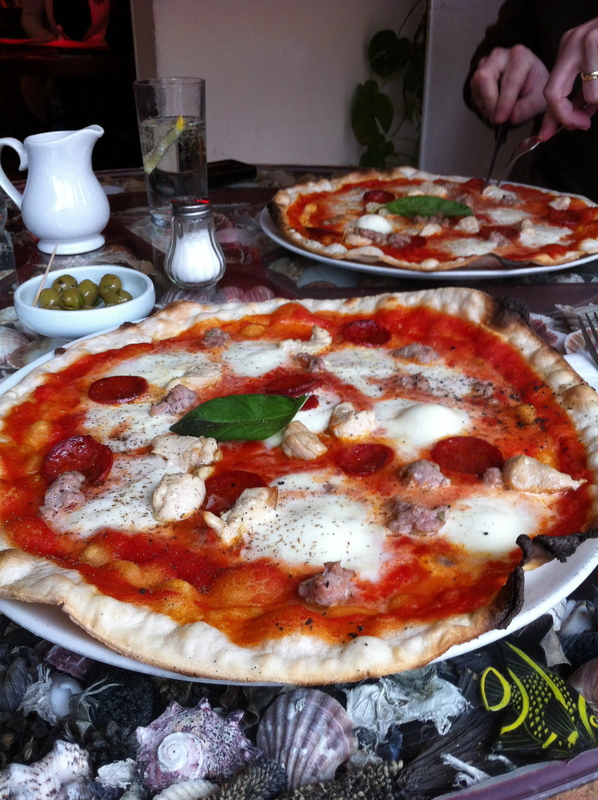 We enjoyed our pizza’s very much, fresh ingredients and friendly staff adding to the experience and such traditional surroundings. 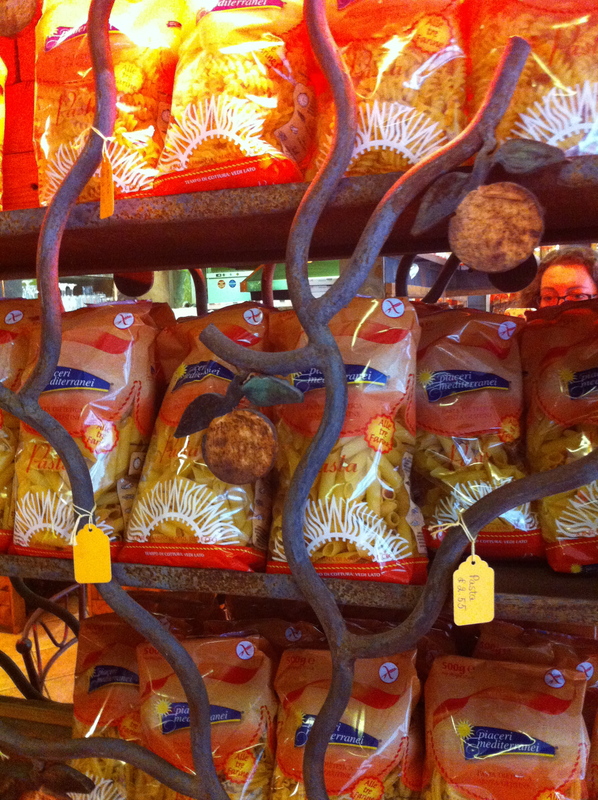 I was fortunate to get a chance to speak to Julia who explained that she goes to great lengths to find the best quality italian gluten free dried pasta’s, breadsticks, biscuits etc which are on sale in the restaurants. Christmas Panettone classes raisin or chocolate chip are still available but are selling out quickly. As it was extra special to be eating out at an Italian restaurant, we allowed ourselves pudding as a treat. 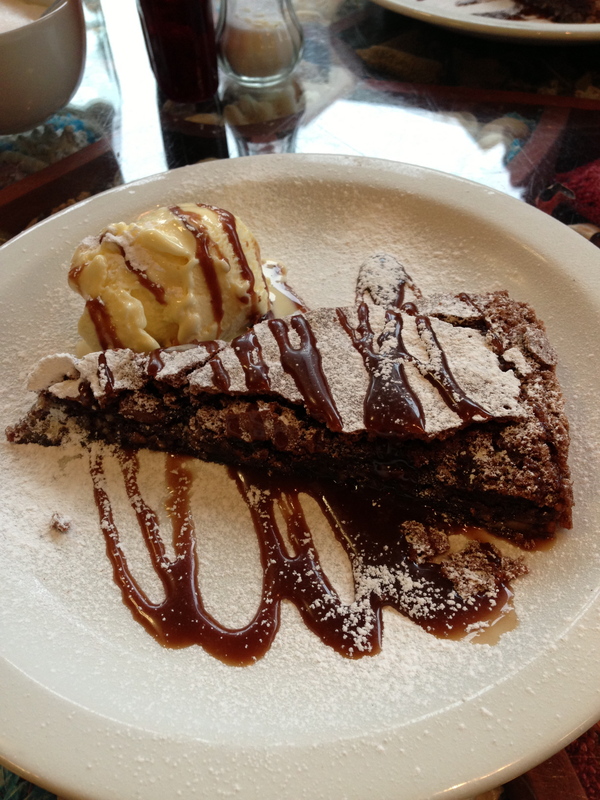 We both chose the chocolate and hazelnut cake slice with ice-cream baked by Julia. It was delicious and a very good size slice. I should have shared a pudding really. will remember next time!? Our meal cost approximately £20 per head for pizza, pudding and a bottle of water. 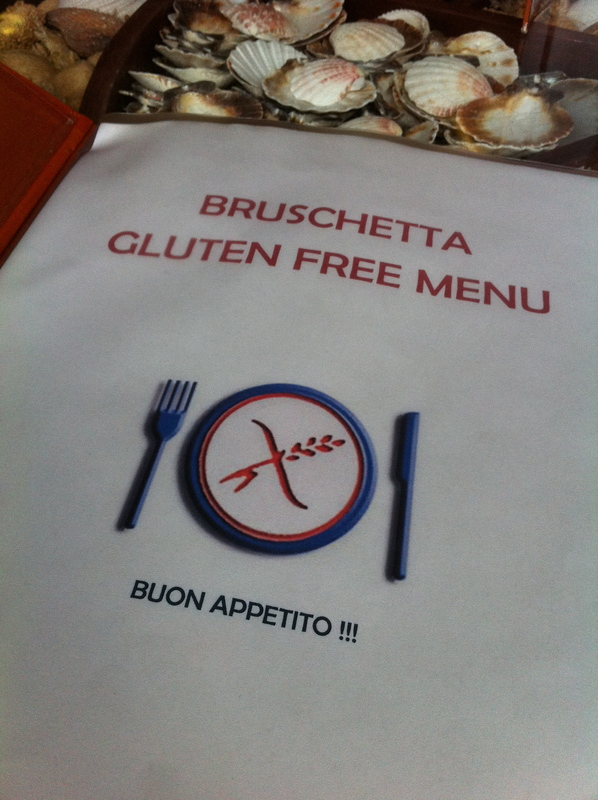 Bruschetta is really worth a trip, the gluten free Italian food is exceptional. The decor in the restaurant could perhaps do with an injection of cash to spruce it up a little but in some ways this just adds to the authentic italian family restaurant feel. 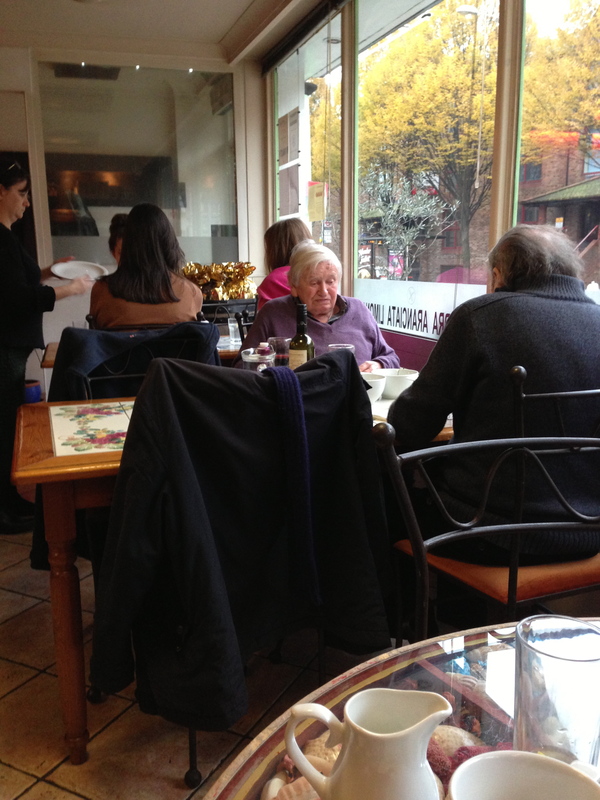 Once the restaurant is full of people eating and drinking with lots of laughter and chatter, nothing else matters. 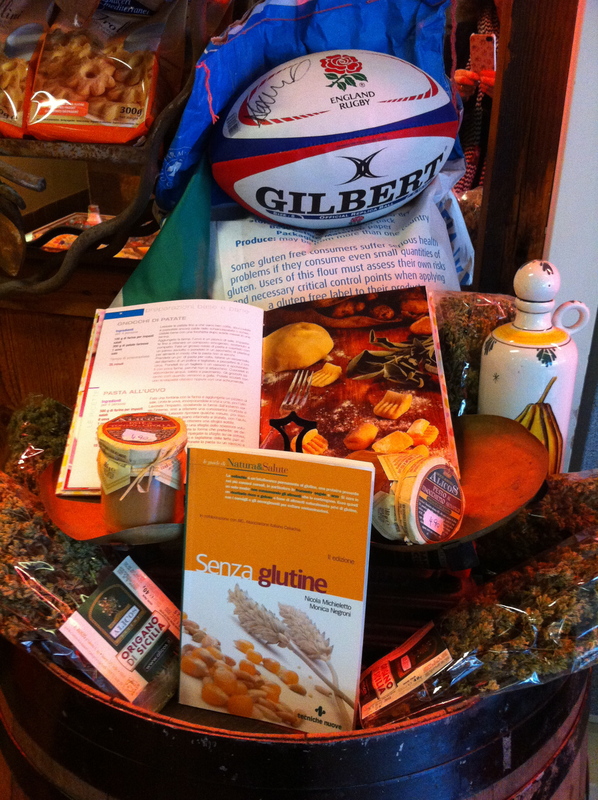 The restaurant is popular with some famous rugby players maybe you will spot one or two when you go along? 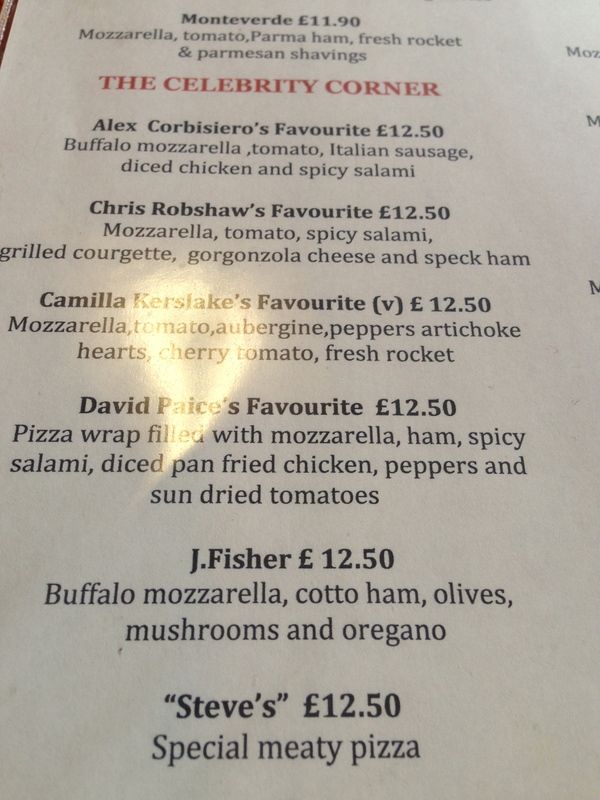 We have seen Alex Corbisiero who plays for England a couple of times, enjoying his favourite pizza with fellow players and friends. On Sunday as my youngest son and his girlfriend were back home after there final Uni exams. I decided to make some gluten free yeast free pizzas for lunch. Following the instructions on the back was very straight forward. I used both packets of Isabel’s Naturally free from pizza base mix, which makes four medium size pizzas. 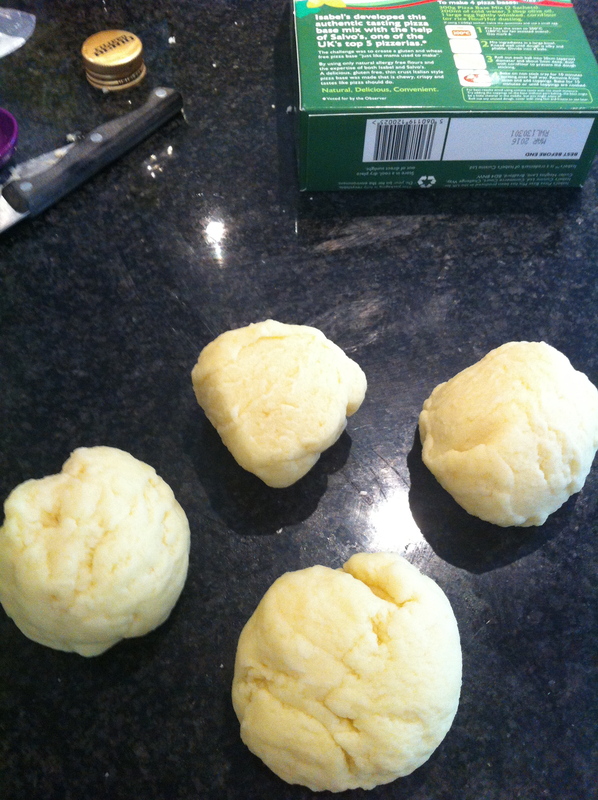 The dough came together very easily and just needed a knead until the dough was silky and pliable. 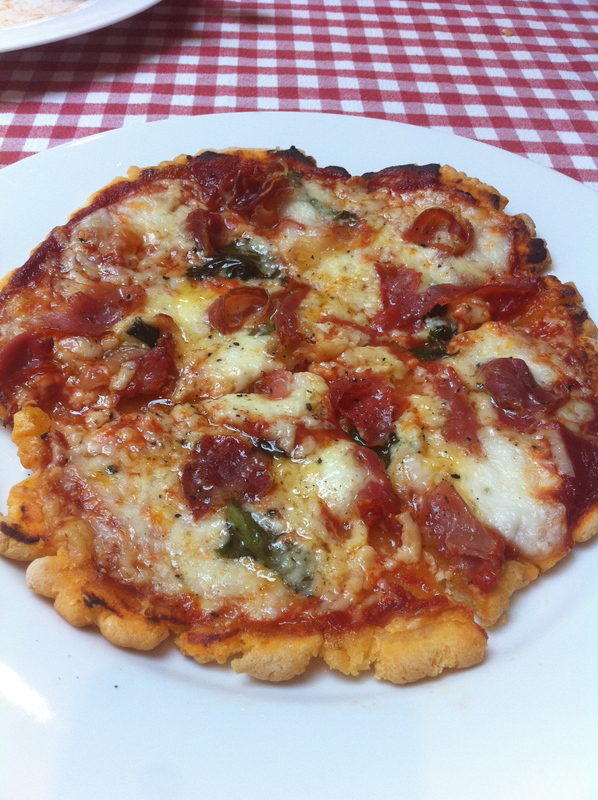 I divided the dough into four equal portions, and rolled out using a little corn flour into pizza shapes. I’m sure with practise I can make them look slightly neater. But for my first attempt they weren’t too bad. 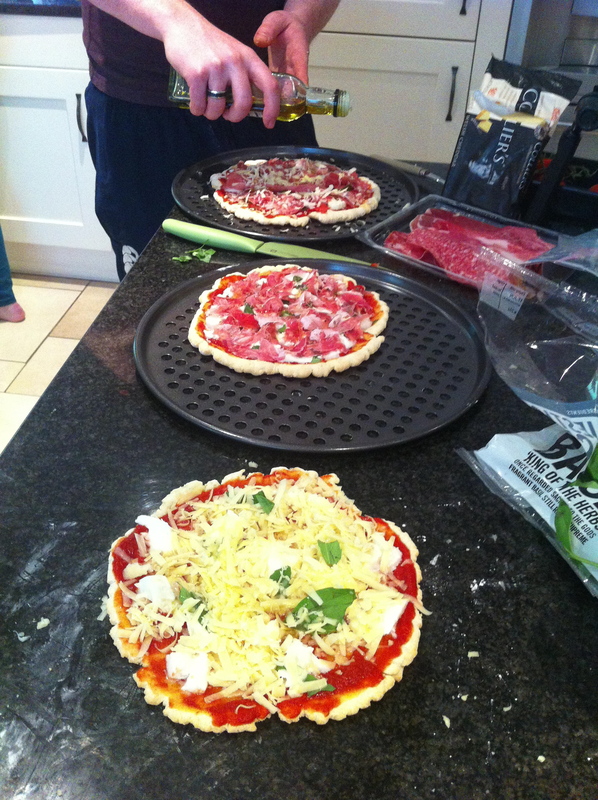 The Pizza’s then went in a hot oven for 5 mins on each side, using good non stick pizza trays. 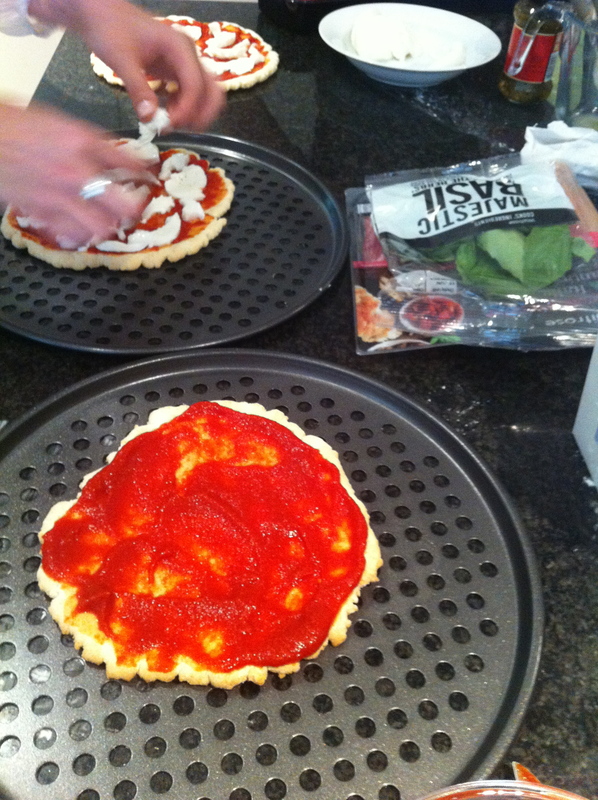 I used a mix of tomato puree and passata to make the tomato base. 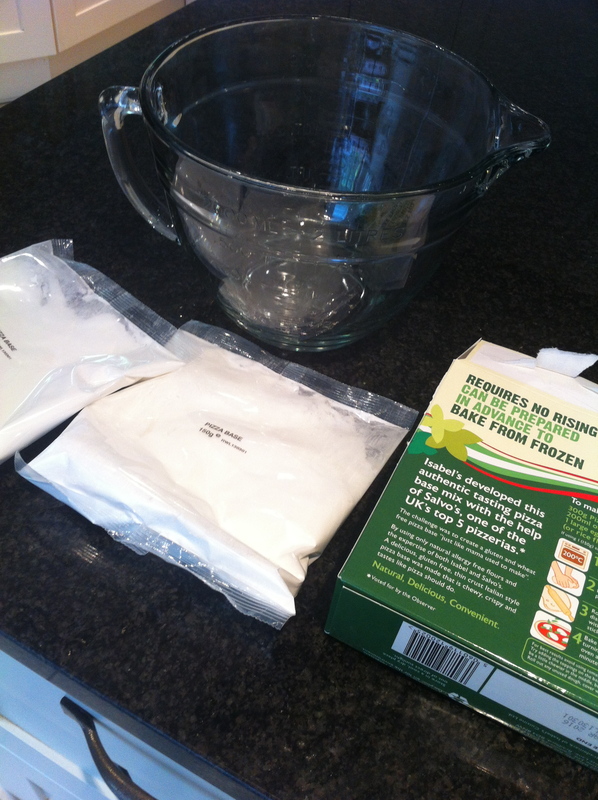 The advice on the back was to avoid a tomato sauce with too much moisture. 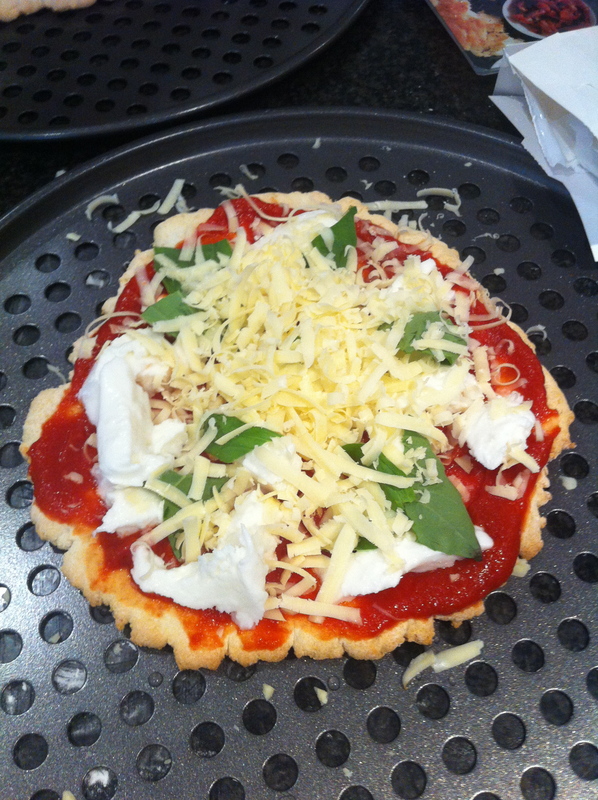 After 10 mins in the oven, we all added our own favourite toppings. mozzarella, basil, italian salami and ham and cheddar cheese. We all had fun decorating our pizza’s . The family’s pizza’s turned out much better than mine. I do like my cheese, so mine was definitely cheese heavy. We all drizzled basil infused olive oil on our pizza’s . They looked good enough to eat already! The pizza’s went in a hot oven for a further 10 mins or so. We watched them carefully, checking they did not burn around the edges. Success! the pizza’s came out looking amazing and smelling terrific. 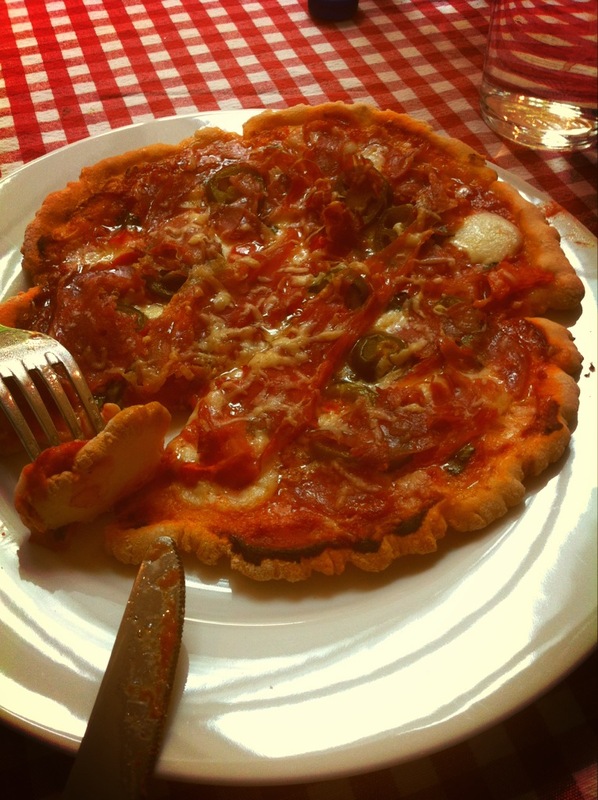 Without prompting the family said that thought they tasted as good as regular pizza, if not better! Strong words from two Uni students who have sampled a few pizza’s in their three years. Both said they would choose to make them again. Result! Much nicer not having gluten pizza’s and flour in the house. I have stock piled lots of boxes of Isabel’s pizza mix’s in my pantry for the future . They will be great for the occasional treat supper or quick tasty lunch. Gluten free pizza at its best! Yesterday my husband and I took a 45 mins drive to Kingston especially to have lunch at Bruschetta restaurant on London road. We were welcomed and seated by the window. The restaurant was not overly busy, but I had not taken any chances and had booked a table. Parking is not easy but suggest Asda car park is your best bet. Perfect to pick up any shopping on your way home. It has a 2 hr limit so if you are after a leisurely lunch then maybe worth looking closer to the town centre. There is certainly plenty of choice on the menu. Lots of delicious starters, mains and puds. The Pizzas range from £7.90 to £11.50. We both decided on the gluten free Alex Corbisiero favourite, which consists of buffalo mozzarella, tomatoes, italian sausage, diced chicken and spicy salami. The pizzas arrived promptly and were straight out of the oven and very hot. I was beyond excited! I don’t have pizza very often so this was a real treat. It had the thinnest stone baked base, crispy and a good size. The topping was quite runny which I loved. Buffalo mozzarella melted into the tomato base just perfect! My favourite of the pizzas I have tried there so far. We both thoroughly enjoyed our pizzas very much. Feeling very satisfied we decided to share a pudding. 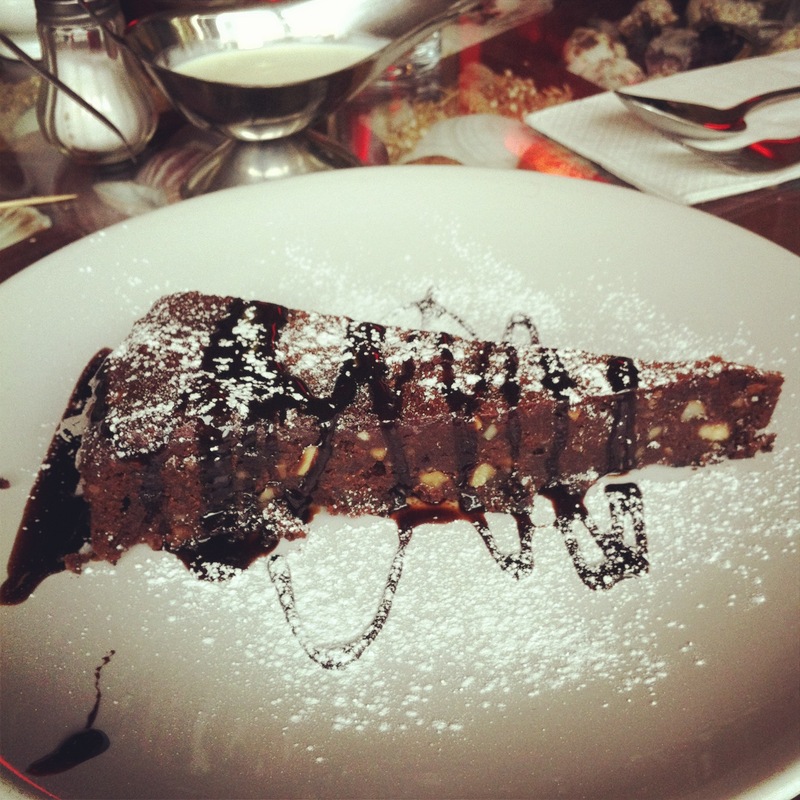 I chose for us the Caprese the chocolate, almond and hazelnut cake. Gluten free, homemade and served with cream or ice cream. Naughty but oh so nice! The cake was soon devoured, a definite 10\10 at £4.25 I thought it was a fair price. Desserts range from £3.50 to £4.25. It was lovely to go out to eat, in the confidence that Chef Julia being gluten intolerant herself, and her team know all about gluten intolerance. They can also cater for other food intolerances too. 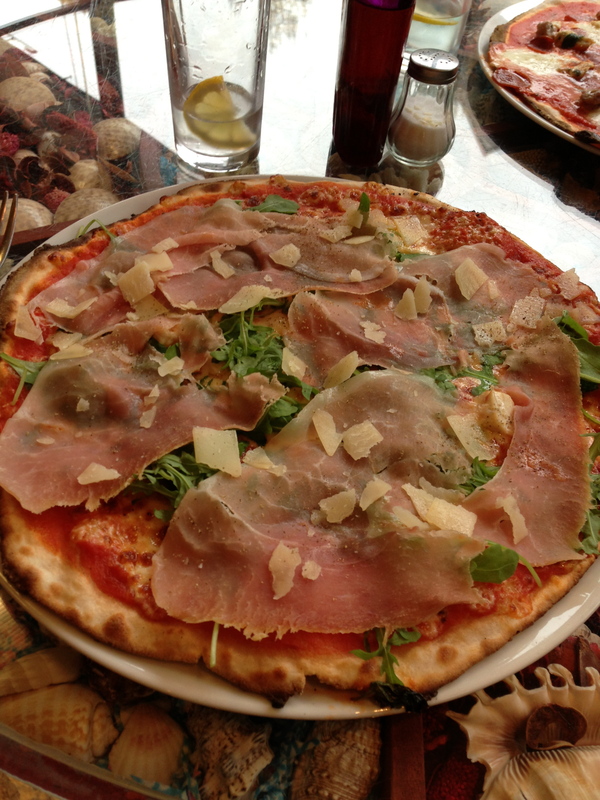 I can recommend this Italian restaurant not only for its great pizzas and fresh pasta. I look forward to returning again soon, many more things to try!